I am trying so hard to have a good attitude today. Really I am. Can you see me straining over here while I try to smile? Yesterday, while I was teaching, the professor and a friend of his moved the whole kit and kaboodle back into our newly painted room. When I came home, I was thrilled to see it. The room looked bigger, even with the same amount of furniture in it. I was excited to get into bed in our "old" bedroom last night. It looked gorgeous. The dogs made themselves at home right away too. They were thrilled to be back in their regular territory. We knew we'd had a successful home reno job. Then, last night, right as I was beginning to put on my pjs, the professor and I looked up at the newly painted ceiling right above my part of the bed (ahh, it looked so beautiful when he painted it...) and we saw the plaster had buckled. There was cracking. The professor touched it. It was wet. This just happened- yesterday. We said a few bad words. We tried to isolate the problem, and as best we can tell, it is a leaking or broken boiler pipe between the second and third floors. Yet, our house is toasty warm, even on the third floor. The ancient boiler is doing an admirable job. Even so, we determined that it wasn't safe to sleep under something leaky that might spew hot water in the middle of the night. The professor sent the dogs and me down to the living room. The dogs were sleepy and curled up for cuddles and I called my mom. Who else can you call at 10 pm CT (11 pm ET-- her time...) to have commiseration about these kinds of *^#%^!! things? Somehow, the professor moved all our furniture on his own back into the "back up" bedroom where we'd been sleeping for a little over a month. This is where the nursery will be when the babies are born. He put down plastic tarp and a trash can in our -again empty-bedroom to catch any spills. We went back to trying to sleep a little before midnight. I was exhausted...but somehow, the city decided that last night was the time to use the construction equipment bobcats to clear large snow piles on the main street outside our house. (Beep beep beep every time they backed up, all night long) Also, we had an endless number of dump trucks, filled with snow, idling on the street as they headed to snow disposal sites. This idling and enormous gas wastage apparently must be done between midnight and 6 AM to avoid traffic problems? This AM, the professor called the plumbers, who now treat us like family. They explained that they are very busy and that both of their master plumbers are out sick. Luckily, we still have heat so there is no desperate emergency--we're all hoping it is a small little leak...but we'll wait until they come by to cut into that section of freshly painted (and now ruined) plaster ceiling. Have I mentioned that it's downright cold here lately? I am considering throwing in the towel on this day and creeping back under the covers again with a dog or two to keep me warm. Good news? The carding class went well. There are still more Florida pictures to enjoy later in the week. We're all safe and warm and no one was burnt by leaking hot water in the middle of the night...I guess it's time to be grateful for all these things...right? Last week in this time, we were in Sarasota, Florida. The professor, his father and I went to the Farmers' Market. There was a lot of produce (strawberries, greens, citrus, etc.) and a lot of other vendors. I couldn't dally too much in front of the seafood stalls with the stinky fish smells--still dealing with nausea--so we focused on other things. There were plenty of things to see! Then we saw some amazing flowers for sale. All sorts of exotic varieties of flowers, usually only for sale at a florist's shop, right here at the Farmers' Market! We were also serenaded by these teenagers, who played remarkably well together considering their instruments. All of their instruments were made of discarded materials. Yes, a TRASH band...check out the cereal box guitar. It's a shame you can't see the drummer in this picture, he was really going to town on a drum set made up entirely of overturned pails and other junk. It was a treat to hear and see! The professor and I knew that our dogs would not enjoy these crowds even if they were in Florida with us. (they were in the kennel in Manitoba) Even so, we met some dogs who did. We're pretty sure their humans never even noticed we were petting their dogs, taking photos, or smiling at them! It was about 50F (10C) when we were at the Farmers' Market. The Floridians thought this was cold. I wore just a sweater and it felt like a heatwave to me. Bear in mind, of course, that today it is -25F (-32C) here in Winnipeg, with a windchill which brings the temperature dow n much further. Of course, the professor and our dogs wore their sweaters today for their walk. I think the professor even wore insulated jeans, and he is very tolerant of cold temperatures, so you can imagine that it was actually cold outside this AM. Apparently dogs in Sarasota needed their sweaters, too. I sat outside eating a strawberry chocolate crepe while the locals said how very "cold" it felt that day in Florida. It was hard for me to figure out what to say! In any case, the crepe was good and the weather seemed very pleasant to me as well. Obviously, I wasn't the sympath etic ear these strangers needed as they complained! We have more photos of nature and I'll try to draw out our vacation so you too can have a vicarious vacation through the blog. I've got the photos for at least one more post. In any case, I hope you'll feel amused by the dogs in sweaters on a 50F day! We were! Most sweet were the puppies, who were trying to meet everyone at the market. I am a sucker for puppy fur, puppy teeth, and puppy breath. (Always have been) I love my middle aged dogs very much and it is fabulous to have mostly trained and cooperative family members. That said, every so often, every 10 years or so, I yearn for a puppy. I try to get my fill by visiting with other folks' puppies. I certainly think it makes life easier. Housetraining one's puppy at -25F? Now that does sound unappealing! I'm off to eat lunch before teaching my hand carding class this afternoon. I hope it goes well--and maybe I'll even meet some of my blog readers there. Part of my trip to Virginia was spent in celebration of grandmother's 95th birthday. The real event isn't happening until the beginning of February, but my mom invited lots of relatives for a family dinner. My mother expected a total of 14 dinner guests. When I fell asleep my first night in Virginia, I realized there were 8 people in the house, and usually there are half that many occupants. 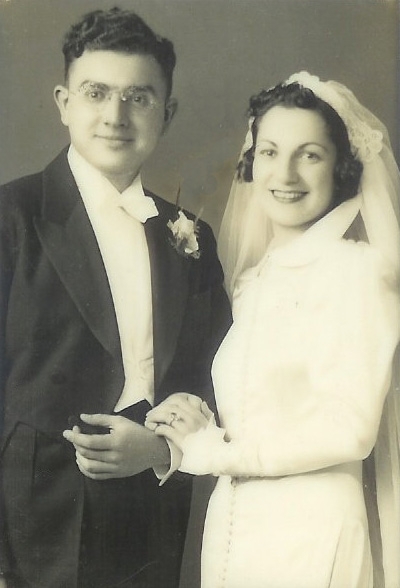 Even so, the day before, my uncle and his partner decided they shouldn't come from Boston because he had a bad cold and didn't want to get anyone else sick. We arrived in Florida yesterday to see some of the professor's family. The temperature shift is enormous, fully 100 degrees Fahrenheit warmer. When our plane landed, it was 80F. When we left Winnipeg, it was around -25F. While it is still warm here, I continue to bring the weather with me. This morning, there was a huge thundershower and lots of fog. While this means the professor cannot go out to do his field work and collect his butterflies, it does mean we ha ve some quality time together instead. Butterflies don't fly while it is rainy, windy, cold or foggy out. We went to Whole Foods (fancy grocery store) where the professor found these tomatoes. He loves heirloom tomatoes, but I think the package is pretty funny, too. Fibery people, I am sure you will see the joke here. I found myself wondering how they'd gotten one of these into the package. Next, we found a Florida grown Pomelo, one of my favorite fruits. When I was a teenager, I lived on a kibbutz for a year as a study abroad program. Behind our class dorm area, there was a citrus grove with Pomelos. We could pick them after school and eat them as a snack. My roommate and I used to share one. It always takes a long time to eat! I am thrilled to see these are now being grown in North America as they used to be hard to come by. I used to only be able to buy them in Asian groceries each winter, since they are mostly grown in Asia. We also found moose dog toys with squeakers--so weird to find these in Florida. In Manitoba , we actually have moose living in the province. I have never seen a moose in Florida, but apparently the dogs needed us to travel to Florida to get them provincially appropriate squeaker toys. (As some of you know, my dogs are suckers for these toys...they love them.) We had to buy two, of course, as they fight over any toy without two exact replicas. Good practice for twins, we figure. We've also seen egrets, armadillos, sand cranes, palm trees, a great sunset and lots of flowers...but I never had my camera ready to catch those images. My knitting for this trip is mainly black wool, so it is very difficult to photograph. My father-in-law has saved me months' worth of New York Times "dining out" sections to enjoy. He must have waited unconsciously until I stopped being quite so sick to my stomach. I am now still occasionally nauseous, but at this point, I can eat out and read about food. It makes all the difference. Note the section on top--about how pies are now gaining popularity over cupcakes. (Those who know me know I am very serious about pie...especially fruit pie. I love it.) Of course pies are now the newest fad in NYC and San Francisco. Of course--they were the most popular fad in my house a long long time ago! Just thought you might like a vicarious slice of vacation frivolousness. I'm off to eat some chocolate and take a nap. Ain't vacation grand? A few days ago, I went on an adventure with our resident student. (Sadly, she is not in residence anymore, but went home yesterday...I missed her presence right after she left!) The adventure involved going to Value Village to hunt up wool sweaters. It's harder than one might think to buy 100% wool sweaters in Kentucky. Winter in Kentucky gets cold, definitely below freezing, including snow and ice on rare occasions, but for some reason, retailers and consumers there don't think that people need natural fiber gear for winter. Our visiting student needed serious winter clothing for her visit, so we gifted her with several wool sweaters and went to shop for more. Then, another friend of mine in Northern Kentucky sent in a request--would we shop for her, too? In the end, I washed and sent our student home with an extra suitcase and something like 12 fabulous natural fiber sweaters from Winnipeg thrift shops. Our student also received 3 sweaters as gifts from us--sweaters that were hanging around, including this one that I knit but never wore. It just didn't suit me in the end. It was fun to shop for gorgeous wool, cashmere and silk sweaters for other people. As the professor has pointed out, I have more enough sweaters, so this was a good excuse to sweater shop for others! Today is the day I prepare for my trip. I haven't actually flown anywhere since May--and that is a long time for me to go between trips. I've missed travelling. At the same time, I am finding packing hard this time around. Never mind the belly, which changes from day to day, I am confused about how to pack for the temperatures we'll experience in Virginia and Florida. I likely won't need my winter boots on this trip. (I wear winter boots every single time I go outside here in Winnipeg from November through April) Right, that makes sense, but we've got several feet of snow on the ground here, so I just will wear shoes with good tread to the airport. What about sweaters? What weight jacket do you wear when the predicted low is -10F (-23C) tomorrow here and 29F (-2C) there? No matter how hard I think about it or sing the Crowded House song, I don't take the weather with me! I take my Winnipeg adjusted body temperatures and ideas about the weather and hopefully my clothing, assuming my suitcase gets there. So, yeah, no wonder I'm confused. To think that I lived about 20 years in Virginia...and I can't remember the winter weather there. Sort of interesting. How much snow do you have right now? What's the temperature!? (Celsius or Fahrenheit?) What's cold where you live? Here is the full schedule of upcoming fiber arts events...I am going to be busy for the next month! --I'm pasting in the announcements for each event below. All are welcome…I’d love to see you! There will also be a chance to buy books and/or have me sign your books after the event. These are all terms we now associate with our food choices. Did you know all this relates to your clothes and your hobbies, too? Join Joanne Seiff, author of Knit Green: 20 Projects & Ideas for Sustainability, as she helps you navigate through the many complicated “Green” decisions out there. While Joanne’s book focuses in particular on the hand knitting industry, the implications of this information go far beyond hand knitted socks and scarves. Do you care about green issues and wear clothes? Then this presentation is relevant to you. If you are one of the approximately 50 million people in North America who knit, crochet, or do fiber art, please join us in learning about how to make ethical and sustainable choices in needlework and in clothing, too. 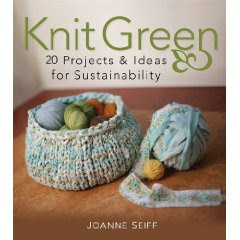 Joanne Seiff is the author of two books published by Wiley & Sons, Knit Green and Fiber Gathering. Joanne is a freelance writer, educator and knitwear designer. Although Joanne practically grew up at TRS, she now lives in Winnipeg, Manitoba with her husband, a biology professor, and her Jewish bird dogs, Harry and Sally. She enjoys wearing lots of hand knits during Canadian winters. Upcoming Book Signing at Picasso’s Moon in Sarasota, Florida! Please join me at this wonderful yarn shop in Sarasota on Monday, January 24th, 2011, from 4-7pm. 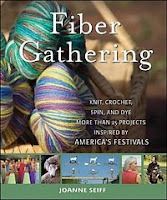 I will be visiting the shop and signing copies of Knit Green and Fiber Gathering. If you live nearby or are on vacation in Florida this January, I hope you can stop by Picasso’s Moon so I can meet you! Handspinning with a spindle is an ancient craft that is still important even today. Everyone in a household, including children as young as four, used to help spin yarn that clothed the family and kept them warm! Join Joanne and learn a bit about wool and learn to use a handspindle to make your own yarn. When you leave this class, you’ll own a spindle, some practice wool, and you’ll be able to practice spinning at home. Spaces are Limited! Register by February 6th to reserve your spot! Want to stock up on fibery goodness while you learn? Cloverleaf Art & Fibre will bring a selection of Shetland wool fleece, roving and art straight from their lovingly raised Shetland flock! Also purchase signed copies of Joanne’s books as well as other goodies…all while learning to spin in a friendly, hands-on environment. Hope y'all can come to something in the above list! Apologies in advance if I am not coming to a city near you...travelling is going to be somewhat limited for a while-with good reason. Thanks so much for all your wonderful well wishes! The professor and I appreciate it so much! I've been longing to tell you a funny story, and now that I've revealed the big news, the other stuff can follow. In the spring time, we moved around all sorts of furniture to clear out a small room for our summer undergradate resident student. She got this (storage) room on the 3rd floor which didn't have a radiator. Time passed, she went home, and over winter break, the professor took on a big painting project. He decided to paint our bedroom. The bedroom color was a yellowish brown which could only be described as looking vaguely (in my view) like, well, baby poop. I found it dark and depressing, but I can't seem to find a photo of it to share with you, so you'll have to take my word for it. The professor thought the paint job itself was atrocious, and we would lay in bed and discuss how awful it was. In order to empty out this room, we had to empty out the "loom room" next door so we'd have a place to sleep. We then moved all that fibery stuff up to the 3rd floor, into the little "student" room. Early on in my pregnancy I moved all the lightweight boxes filled with wool upstairs. Two or three weeks later, I went to rearrange those same boxes and they had become very heavy! The professor announced my box moving days were over...and friends helped u s move the loom upstairs. During this massive reshuffling of wool (I have a lot), the resident student from Kentucky scheduled a return visit to Winnipeg to do more work with the professor. She was absolutely crushed that she couldn't use her "old" room. I told her I could not let her sleep there in winter since there is no radiator in the room. It isn't warm enough! She'd never been to Winnipeg in winter so hadn't quite cottoned on to what I was saying. Then, feeling frustrated, she asked why the loom wouldn't be moved right back downstairs when the painting was over. That's when the professor couldn't keep the secret any longer and said, "But then where would the babies go?!" (we've planned to leave this other room, next door to our bedroom, mostly empty after the painting shuffle until the babies arrive.) The student was so surprised she nearly cried. I laughed a lot. Luckily, the student has been ok in the guest room so far. :) She hasn't complained about the extra space, the larger bed or the radiator. Not one bit. PS: I haven't been spinning or weaving much in the last several months since getting pregnant. Turns out that these activities relax me and lower my (already kind of low) blood pressure. Then I would stand up from spinning or the weaving bench feeling so teetery that I thought I might keel over. (Yes, I have fainted in the past, though not lately) The doctor also suggested I only take showers when someone else is home, because I might keel over in the warm shower, and hit my head on the cast iron claw foot tub. So, you know, knitting is still safe because I mostly do it sitting still! PPS: I am doing a lot of teaching, booksignings, and even a lecture in January and early February! I will post more about that soon. For now, there is more information about a spinning class, booksigning and Knit Green talk here and about the January 30th handcarding class here. Last year, on my birthday, I thought I had lots of big news. I had a big new-to-me floor loom, for instance. This year, the birthday news is bigger. You may remember from my posts this fall that I felt under the weather a lot...with both asthma and with nausea. I was also on a medicine that made me feel stoned and made it hard to drive. That is because, with the help of a little technology, I am pregnant. With twins. (Apparently, twin fetuses offer twice as many hormones--so twice as much nausea.) Yup, it's been a long haul so far. I am celebrating tonight because the professor and our visiting resident student took me out for a birthday dinner. So far, I am even keeping it down, which is wonderful. I've learned to be grateful for small things! These twin fetuses, formerly nicknamed Nausea & Vomit, have now been renamed. The professor objected to those nicknames, but then, he was only a helpful bystander to why I called them that! (A bystander who did the shopping, cleaning, cooking, and all sorts of other things to help me cope.) Lately I've been calling them the kugel twins, after Lokshen Kugel...one of my favorite childhood foods. Lokshen and Kugel are doing fine so far. The stork should deliver them in May or early June. Their due date is in early June, but twins often arrive early, just like I tend to do, if you know me! Locally, people already know about this because I've already got quite a belly and have been wearing maternity pants since November now. Twin fetuses take up a lot of room! It's hard to hide such a big belly! We are adhering to traditional Jewish customs and will not be announcing any names, genders, or other details before the babies are born. We're not acquiring anything for these guys until they are born healthy--so no baby shower before the big day, no nursery acquisitions, etc. Of course, if you had a big urge to knit baby clothes or soakers or longies or something for no baby in particular, well, I can't stop you...and I'll send you grateful thanks and my address in May/June! Thanks to all of you who have been cheering quietly behind the scenes for me as I went through many years of trying to get pregnant. Thank you so much for your gentle support. I appreciate you more than you will know.